It is also known as the “City of the Messapians” and “Primitivo”. Manduria is located in northern part of Salento, at the same distance from Taranto, Lecce and Brindisi. Because of this, it comes the city motto “Salento has a Heart”. Founded by the Messapians, still bears witness to its historical past, including the megalithic walls, surrounded by the remains of the moat that surrounded the city, and the necropolis. Among the main monuments in this area, there are the main church (Chiesa Madre), the Jewish ghetto, the clock tower, palaces with a noble appearance built in various eras and parts of the ancient Messapian walls. 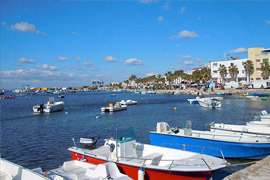 It is located on the Ionian coast of the Salento peninsula, an important tourist resort in Salento. At the time of the Romans, it was called Portus Sasinae, when it was an important port for trade in the agricultural products of the rich inland areas. Along the coast there are four watch towers built in the sixteenth century to protect the Salento peninsula from enemy invasions: Torre Cesarea, Torre Lapillo, Torre Chianca and Torre Castiglione; only some ruins remain of the latter as it was demolished during the Second World War. 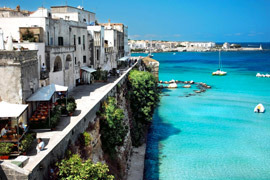 It turns out to be one of the cities in Puglia that most benefits from the large flow of tourists during the summer months. Gallipoli is in fact an international destination for summer tourism, given the large number of visitors coming from different countries of Europe and the rest of the world. It overlooks the Ionian Sea, along the west coast of Salento. In addition to the marvelous territory in which it is immersed, the architectural structure itself of the city of Gallipoli is very suggestive and attractive, thanks to a rare particularity: it is in fact divided into two parts, the village and the historic center. 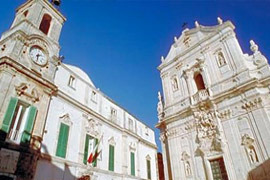 It is the provincial capital and the major cultural center of the Salento peninsula and it is home to the homonymous archdiocese and the University of Salento. 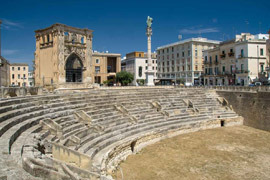 Lecce is located in the central-northern part of the Salento plain, the territory of Lecce overlooks the Adriatic Sea for about 20 km. The low-lying coastal areas have long sandy stretches, along which there are centuries-old dunes covered with Mediterranean vegetation. Along the coast there are some fortifications, built in the sixteenth century to cope with Saracen incursions. Along the coast there are four watch towers built in the sixteenth century to protect the Salento peninsula from enemy invasions: Torre Cesarea, Torre Lapillo, Torre Chianca and Torre Castiglione; only some ruins remain of the latter as it was demolished during the Second World War. Known for the Valle d’Itria music festival, it stands on the southern slopes of the Murgia, on the border of the provinces of Taranto, Brindisi and Bari. 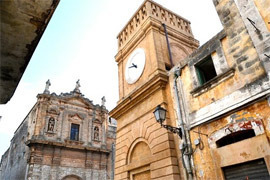 Until the Unification of Italy, the historic center of Martina Franca was closed by a wall, 12 square towers, 12 round towers and four entrance doors. Currently the doors have lost their function of exclusive access into the city becoming sober and elegant arches. Of the ancient gates, only the upper stone rings that were used to hold the hinges of the massive doors are still preserved today. Also known as the White City, because fo its characteristic historic center that was once entirely painted with white lime, today only partially. Together with Taranto and Santa Maria di Leuca, it is one of the ideal summits of the Salento peninsula. Renowned tourist center, in 2008, 2009, 2010, and 2011 received the Blue Flag and the five sails of Legambiente for cleaning the waters of its coast and for the quality of services offered. 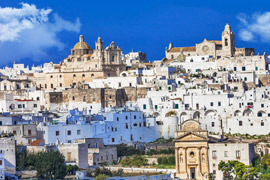 Moreover, in 2005, the Puglia Region recognized the city as a “tourist resort”. Located on the Adriatic coast of the Salento peninsula, it is the easternmost town in Italy: the homonymous cape, also called Punta Palascìa, south of the town, is the most easterly geographic point of the peninsula. 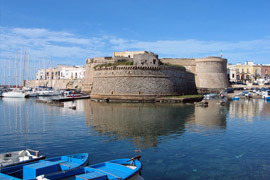 Initially Messapian and Roman, then Byzantine and later Aragonese, the center of Otranto develops around the imposing castle and the Norman cathedral. An archiepiscopal center and a significant tourist center, it gave its name to the “Canale d’Otranto”, part of the sea which separates Italy from Albania, and to the “Terra d’Otranto”.